A couple weeks ago I was fortunate enough to snag an invite to a highly anticipated event at Neiman Marcus here in DC. It's an annual beauty event called "Beauty & The Blogger" and it showcases different lines and their new release products. I left with quite the stash (c/o of the companies and Neiman Marcus) and wanted to share a couple of the items that were standout to me. Some of these are new, some are just samples that the lines provided us with. Bobbi Brown Hydrating Under Eye Cream: I have an on/off relationship with eye creams. Honestly, I don't really feel like they do a whole lot for me. Maybe it's because I can't remember to consistently put them on at night? Anyways, this little pot has a very nice formula and for some reason I've been remembering to use this guy more than some of the other samples in my makeup collection. I'll keep you posted. Lancôme Eyelash Curler: I've always used/bought lower-end, drugstore eyelash curlers and never really bothered with a high end one. I thought, eh it curls the lashes they must all do the same thing. Wrong. This little guy has a totally different opening than my cheapy ones and gives some serious impact upon curl. I'm definitely understanding the appeal to a good eyelash curler. Kiehls Ultra Facial Cleanser: I am so, so happy with this product. I also received the hand salve and a little pot of moisturizer; but this cleanser has been the one item I've been using every day. It's a super gentle cleanser that has almost a gel like consistency, which slightly foams as you massage it in. Since nothing tops my No.7 Hot Cloth Cleanser for removing my makeup at night I've incorporated this product into my morning routine. Clé De Peau Beauté Mascara: This mascara has a jet black formula and has some serious staying power. Normally I don't have too much issue getting mascara off but this one did not want to budge at the end of the day. The brush has a nice curve and the bristles have enough separation to comb out the lashes. It's not my all-time favorite but a great option to throw in my bag and keep handy due to it's sample size. ps: Head over to Naina's blog (HERE) to see my post on the new releases we learned about at Neiman Marcus. This review goes into depth about the products that just came out for Fall and I loved! *While all products are c/o, all opinions are my own. I only shared the few items that I felt were really great takeaways and have been incorporated into my regular route! Need to try these out. Your photography is always so great! 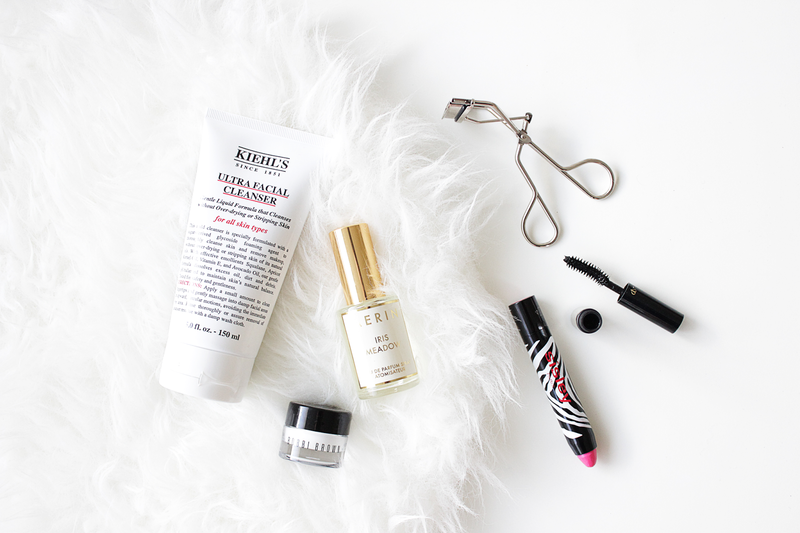 I love kiehls! Gorgeous photo. This has been my first time using a Kiehls product, I definitely understand the hype now!